It's the third day of previews the new March release! After this, there's only ONE more day of fabulous new goodies to share...then it's shopping time! The two new release products that we are showing off today..the Wanderlust stamp set and SugarCuts - America the Beautiful. This new stamp set is so versatile for card making, scrapbooking or journaling! 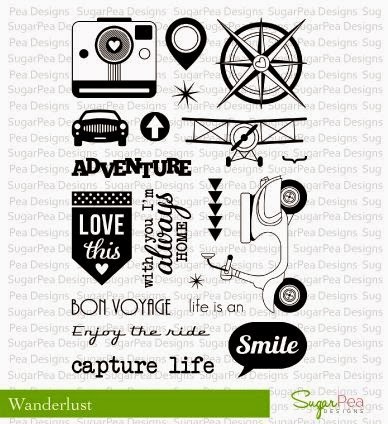 I LOVE all of the fun travel elements that are part of this stamp set...makes it a must have! AND...take a load of that awesome USA SugarCuts die! So perfect! We would love to hear your thoughts on the products introduced today!! 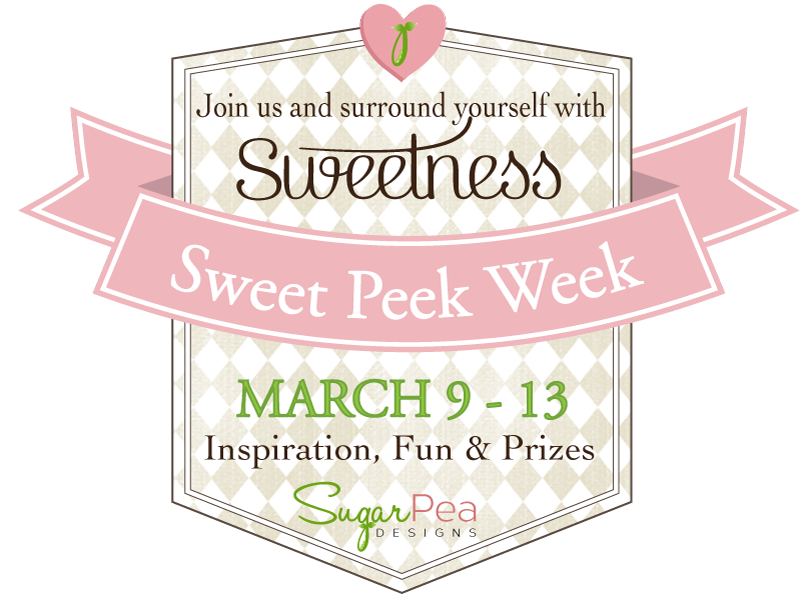 Please leave a comment on this post and on each of the talented SugarPea Designers shown below and you could WIN! We will chose one lucky person to WIN a new stamp set from the comments left here and on the DT Blogs! All winners during our March Product Release will be announced on Sunday, March 15th. I kept today's card a bit masculine to give to my own manly man! His job requires him to travel quite a bit, so this will get tucked into his duffle bag very soon! For my card, I die cut the new SugarCuts - America the Beautiful and placed just the outline portion over a couple layers of coordinating paper, then I propped up the ILLINOIS state piece. 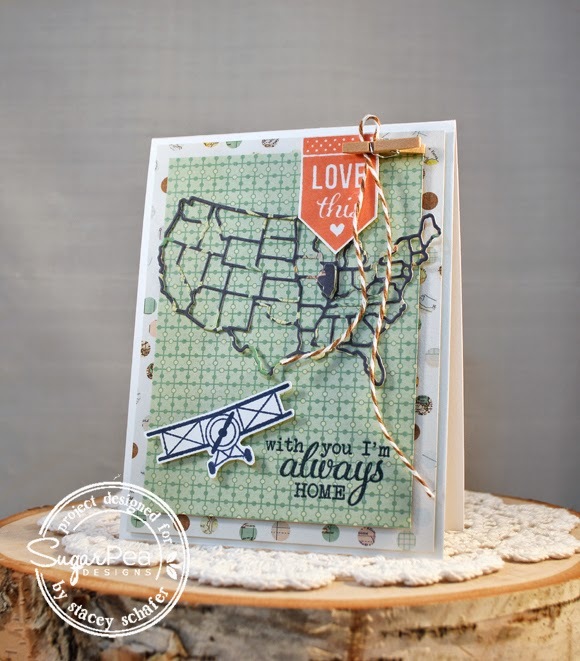 That's where I'm from, ya know:) After stamping the Wanderlust plane and the geo-marker and fussy cutting them, I added them to the card front along with a coordinating sentiment, a wooden clip and loose piece of baker's twine. Outstanding design! Everything works so well together! Beautiful card! Love the plane and the use of the paper!!! Super cute card! I love how you used the die! Love the airplane stamp from the previous set...So cute!! Oh this is so very cute! Fabulous card, Stacey. Perfect for your man! Beautiful! Love everything about it!! Your traveler is going to be so tickled to find this in his duffle! Cool card. Love the map and airplane. Fab color scheme and I love mixing it up with the airplane! Great combo of the die and the first day's airplane image...great card. Great card. I like how you are used just the outline of the United States on this card. Hubby will enjoy the card. Love that you added the airplane. Leaving the map uncolored was a good idea. Love all the elements and how you combined them on this super cute card! SOOOOO cute!! I kind of figured you must be from Illinois from the map. : ) But I love the idea and all the papers are fabulous. Love the little bitty clothespin; so adorable. Fantastic card!! Your use of pattern paper is inspiring!! Such a fun card and so trendy and chic! Fantastic use of the dies/images, they look great with the paper you used! What a cute and clever card! Love how you highlighted your state! Oh, how fantastic. Love that USA die. Pairing it with the airplane was genius. Loving the new products from SP. Love the card. The colors work really well with the theme. 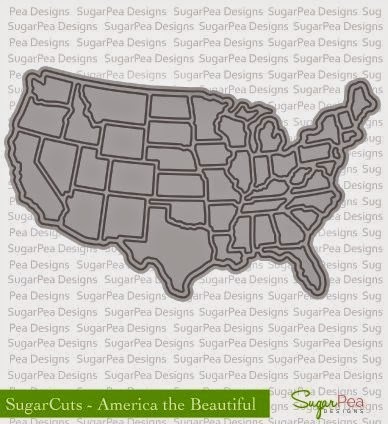 I love the idea of using the diecut outline of the states! The paper you used is so cool too. I can see so many ideas brewing for this particular set - love it! A great card and I really like that die. Too bad I'm Canadian. 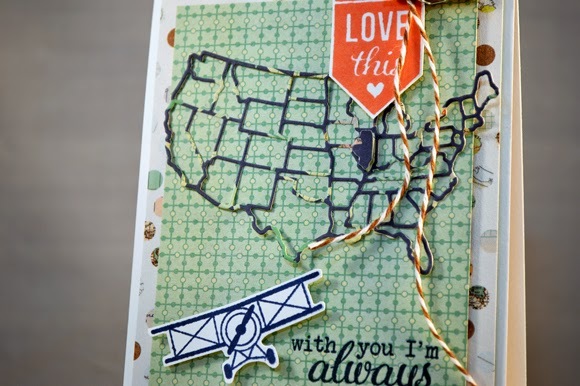 What a great design- love the cards and the America die is fun, my grams lives in Iowa and I am in California- could really do something fun with hearts on the two and arrows.... loving it! I think that your own manly man is going to love this super cool card that you crafted for the hop!